City Parks, State Parks and National Parks are all important for the well-being of people and for the health of our planet. Having access to and spending time in community green space has been proven to have positive psychological effects. So it seemed like a no-brainer and I guessed it might’ve been an easy and pleasurable job to designate our nation’s parks. 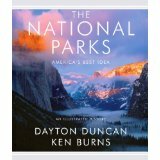 Instead the establishment of the national parks was a drama- even sometimes tragedy-filled endeavor. The people who were working hard to make the parks happen at times lost hope and it was a years long process. This book fascinatingly tells about the people, places and obstacles involved. There is also a companion DVD set.